Superficial peroneal (musculocutaneous) nerve: With the exception of the skin of the cleft between the first and 2nd toes. it supplies sensory nerves to the majority of the dorsum of the foot . It also supplies medial margin of the great toe. 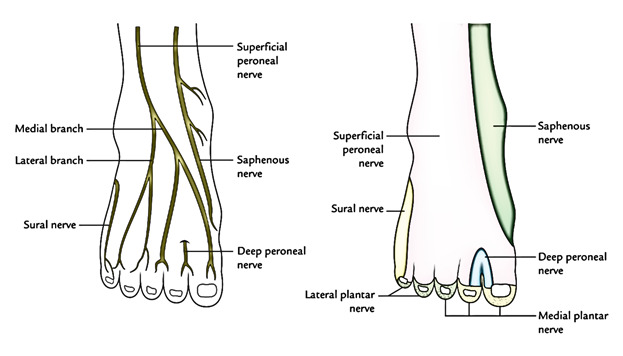 Deep peroneal nerve: It gives nerve supply to the cleft between the first and 2nd toes. Sural nerve: It supplies lateral margin of the dorsum of the foot and lateral margin of the little toe. Saphenous nerve: It supplies medial margins of the dorsum of the foot up to the head of the very first metatarsal. Extrinsic tendons of the muscles of the anterior compartment of the leg (viz., tibialis anterior, extensor hallucis longus, extensor digitorum longus, and peroneus tertius). 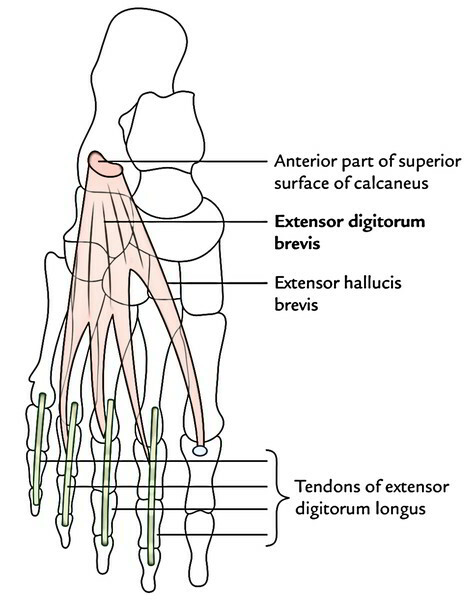 Intrinsic muscle on the dorsum of the foot is only one – the extensor digitorum brevis. It’s a small muscle situated on the lateral part of the dorsum of the foot, deep to the tendons of extensor digitorum longus. It’s the only muscle on the dorsum of the foot and creates a fleshy swelling anterior to the lateral malleolus. The young beginner physicians sometime diagnose it as a contusion. 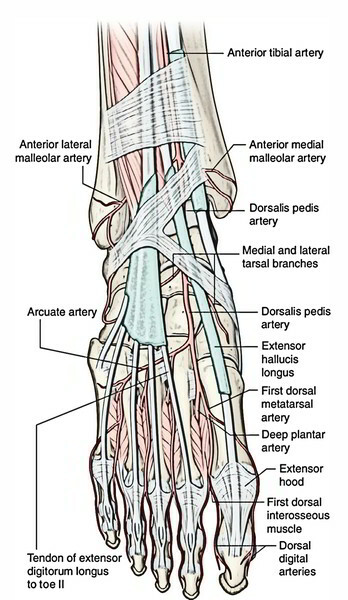 The dorsalis pedis artery is the just the continuation of the anterior tibial artery. So it starts as the anterior tibial artery passes by the ankle joint. It goes anteriorly over the dorsal aspect of the talus, navicular, and intermediate cuneiform bones, and then passes inferiorly, as the deep plantar artery, between the two heads of the first dorsal interosseous muscle to join the deep plantar arch in the sole of the foot. The pulse of the dorsalis pedis artery on the dorsal surface of the foot can be felt by gently palpating the vessel against the underlying tarsal bones between the tendons of the extensor hallucis longus and the extensor digitorum longus to the second toe.